InLoox PM 8 uses its own division structure which is independent of the Outlook one. This structure is available only in the InLoox PM Enterprise Edition and is selectable in the projects. The divisions can be structured to any level and can be assigned to a specific project. you can also add the resources to the divisions. Insert a new division to change the division structure. Click New and enter a name in the Name box and notes in the Description box (if necessary) in the dialog box New Division. In the Resources area, click Add. 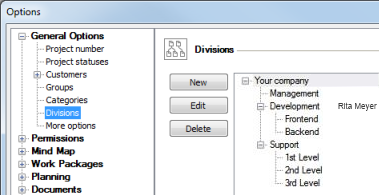 In the Address Book dialog box, select a contact and click OK.
Now the new division with the resource in the division structure is displayed. Edit the existing division structure. Choose one entry from the division list and click Edit in order to change it. Remove a selected division from the list by clicking Delete. The renaming of a division takes immediate effect in all relevant projects. The deletion of a division takes immediate effect in all relevant projects. The new division is visible on the Management and Work Packages page by adding a resource. How to edit the division structure | InLoox PM 8 • Copyright 1999-2019 © InLoox, Inc. All rights reserved.